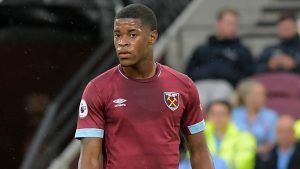 Manuel Pellegrini – given his readiness to let youngsters loose this season – has an opportunity of blooding two more exciting academy prospects before the end of the season. So far this term we have seen the ultimate development of Declan, the raw potential of Grady Diangana, a glimpse of exciting defender Ben Johnson and a decent display by Xande Silva in the FA Cup win over Birmingham City. There are others too coming along the academy conveyor belt in the shape of midfielders Conor Coventry, Dan Kemp and Nathan Holland. So with just seven games of the season left and with the club entirely safe from relegation there are compelling reasons why Pelle could be tempted to give Silva some action along with a boy who has been tipped for first team honours over a long period – Holland. The manager insists that he remains focused on seventh place and the possibility of European football so he may not take this sort of plunge. But with questions hanging over the future of all our front line striker this may be the time to take a good look at Silva. With little to lose at this stage of the season and with Felipe Anderston putting in some frustrating performances I’d also like to see Holland given his chance. Interesting times …let’s hear from you! Yes, Hugh, I agree – I said exactly the same thing on another thread on the site last week. Give the youngsters a chance – some of their older team-mates have been underwhelming recently to say the least … could save the Daves a pile of cash as well. Sorry- meant to add that if we did end up in the Europa Cup we would regret it next season. So I would like to see some young players given a chance. But selectively. Throw in too many so they play in a side getting hammered by teams with more to play for & nobody will benefit. The manager is being paid a lot of money to make these calls.